I am a crazy tooth brusher. I brush with such force that my dentists have suggested first soft bristled brushes which I can destroy within a week and currently an electric toothbrush which is difficult to find here. I found an Oral B electric and have been using it for the past two years. It has to my astonishment cleaned my teeth to my satisfaction as well as allowing my gums to get back to where they belong. But over the years my teeth had become dingy. Sorry I love coffee and am not going to give it up, and with no teeth whitening strips available in this area, I turned to Colgate Triple Action. The tube shows blanco (white) as their second feature. I did not see a difference in the color of my teeth, plus it seemed to be really harsh on my gums. Then I started to read things about fluoride and triclosan that is an additive in toothpaste and that made me cringe. At my age do I really need fluoride? And what is triclosan? The bottom line is do I really need this in my toothpaste? I don’t think so. 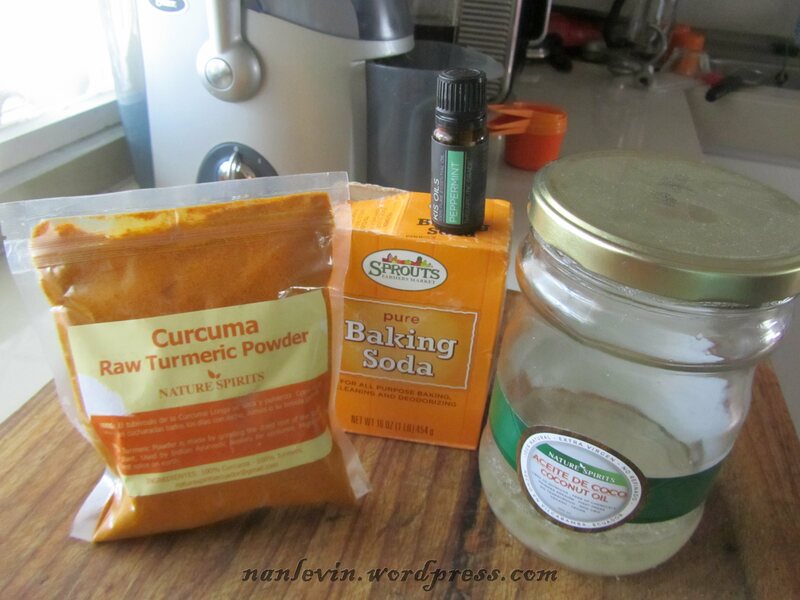 I have seen several articles on using organic turmeric and coconut oil as a tooth paste. I gave it a try and was very surprised at the color change in my teeth. It does not irritate my gums – actually turmeric is anti-inflammatory, contains antioxidants, and is antimicrobial. Whereas coconut oil is antibacterial, this combination is the dynamic duo as far as I am concerned. Mix all ingredients together to form a thick paste and place in an airtight container. Brush as normal for about 2 minutes a few times a day. If you try this let me know about your results, I really think my teeth are much whiter.